Ignacio Cabria García was born in Santander (Spain) in 1955. He graduated in Cultural Anthropolgy at the University of Barcelona and has an M.A. in Social Anthropology and an M.A. in International Cooperation at the Universidad Complutense of Madrid. He has worked in Spanish Embassies and in international cooperation for development in Mozambique, Argentine and the Philippines. He started in ufology in 1976 associated to CIOVE (Santander), and later to CEI (Barcelona), and belonged to the editorial board of the journal Cuadernos de Ufología. He has long been studying UFOs and ufology under the viewpoint of social sciences, and has written two books about that subject: “Entre ufólogos, creyentes y contactados: una historia social de los ovnis en España” (1993) and “Ovnis y ciencias humanas” (2002). His M.A. thesis in social antrhopology was about an Spanish contactee group: "Valores, símbolos y representaciones en una experiencia de contacto extraterrestre: el Grupo Aztlán". 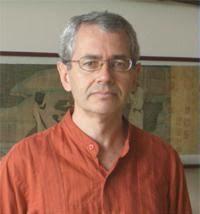 He is also author of papers about history and anthropology of African countries and the Philippines. I particularly do not use the acronym OVNI (UFO), but the noun ovni (ufo), in lowercase letters, denoting that we no longer deal with unidentified observations, but with testimonies that are not neutral, but are loaded with meanings linked to the concept of extraterrestrial visitors. Although I started in ufology in the seventies as a believer in the extraterrestrial hypothesis, since the eighties my anthropological approach has not changed substantially. The investigation of the UFO phenomenon should be undertaken from different angles of the human sciences: the psychology of perception, sociology and anthropology in particular. Not necessarily every researcher should focus on the observation, there are other valid approaches. The fact that some UFO cases could not be explained by the ufologist does not mean that they do not have a rational explanation. The causes can be multiple, without having to resort to the improbable extraterrestrial hypotheses. In short, I believe that ambiguous perceptions are interpreted according to previous beliefs in the myth of extraterrestrial visitations. From my point of view, that of the social sciences, an effort can be made to understand how beliefs in alien visitors are generated and how social phenomena such as waves of UFOs are set in motion, among many others. Of course, SETI is an unquestionable initiative for the understanding of our place in the universe. I do not feel competent to comment on cosmological concepts.